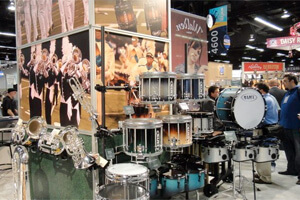 Many of Drum Corps International's corporate partners have been at the Anaheim, Calif. Convention Center this week, exhibiting as part of the 2011 NAMM Show. Featuring concerts, performances, educational sessions and a huge exhibit area with the latest products and innovations in the music industry on display, the NAMM Show is annually one of the largest events of its type anywhere. And in a sea of more than 1,200 exhibitors and tens of thousands of attendees, DCI's corps are well represented, showing up as part of many company's exhibits, like the pictured Quantum line of marching brass and percussion instruments by Jupiter. View a photo gallery on the DCI Facebook page.